Finding it difficult to sustain the Lenten spirit, Christians turned to the writings of Bishop Jacques-Benigne Bossuet. From his sermons and spiritual writings, believers drew ever greater Lenten wisdom and strength. 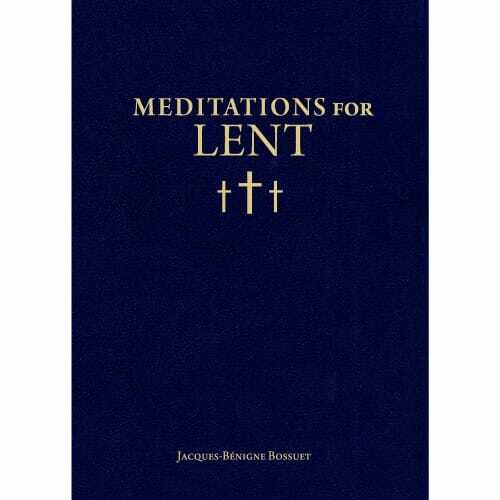 Meditations for Lent features fifty brief but remarkably powerful meditations that complement the daily readings at Mass during the Lenten season, thus serving as the perfect companion for a thoughtful and fruitful Lent. I love this little book, the quiet reflections of this most somber, holy season. I just love reading the meditation of the day. It makes me stop and think instead of just reading it and not dwell on the meaning. I read it before praying my rosary. I really recommend it. I plan to buy other books on the series. First of all, I liked the cover and the format itself was easy to read and follow. Each week of Lent was clearly established and each day also. towards the end of the book and Lent there was a section on the solemnity of St. Joseph and the annunciation of the Blessed Virgin Mary. Great read! Daily meditations that are easy to digest and take only a few minutes to read. Lightweight book is easy to carry with you. A winner. I have not yet read any of the meditations, I'm waiting for Lent, but I am thrilled to have this book for that special occasion. I anticipate all the wonderful things that await inside this treasure box knowing there will be a richness of help within. Can't wait for Lent to dig into this book. I have thumbed through it and it looks amazing and thoughtful. What a blessing to have so many resources at my fingertips from the Catholic Company. Your products have enhanced my spiritual growth in so many ways. Thank you. Blum has done a remarkable job of translating Bishop Bossuet's original French writings on Lent. The clarity, power and eloquence of Bossuet's insights can now be seen and felt for every English reader. This book allows intense focus on the Lenten spirit and is a must for anyone seeking to learn more of the mystery of the faith in a way that leaves you yearning for more. Although I received the book a little late (after Ash Wednesday), I started to use it right away. The meditations were well written for each day following the Liturgy.I am using it each day and find that it strengthens my walk with God. Thank you and God Bless! I feel such peace and more of an understanding of God's love for me and for me to give thanks for what I have been given. I feel all should read this each night, not just for LENT. What a wonderful way to gather one's thoughts during this Lenten season and share this special gift of Meditations...the Glory of God runs thru it and it provides me such peace...thank you. I absolutely love this book and am very glad I purchased it. I feel as if the Holy Spirit is speaking right at me while I'm reading the daily meditation. I love the way it's written and a very insightful way in explaining different parts of scripture, and God's intent to show us His love.